Everything about my dogs is cute, except maybe the poo. 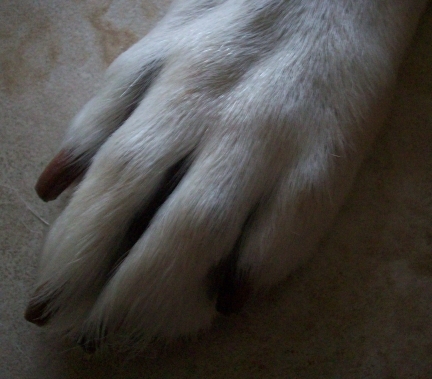 But Maya and Pierson have the cutest doggie noses and paws. And I can’t say enough about their ears and eyes. 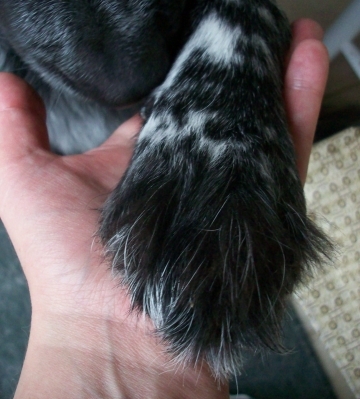 Pierson has the most beautiful tail too. Here are some close-up shots I took with my camera. I love Maya’s big feet. Big and stinky but still cute! Pierson’s back foot as he is laying in his “frog dog” pose. Fuzzy feet and a cute little nose. What a brown-noser! Don’t you just want to kiss it? 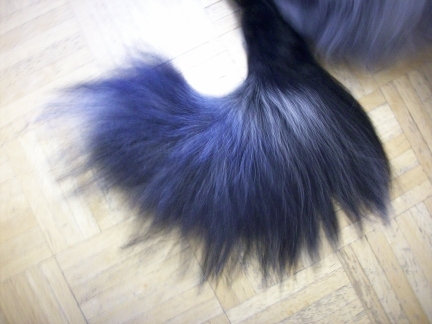 What a beautiful fluffy tail. This is part of the reason Pierson’s nickname is Mr. Fluffybutt. Pierson has cute fuzzy ears too, and a fluffy head. Even when Maya’s ears are inside-out, they’re cute. 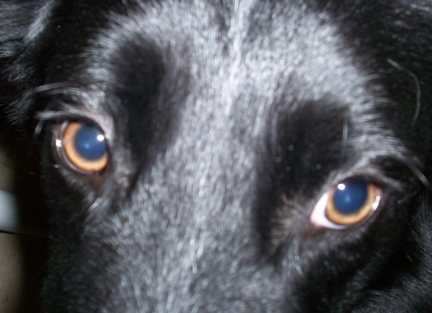 And look at those beautiful brown eyes. I’ve got to get a better photo. Love these little brownies too. 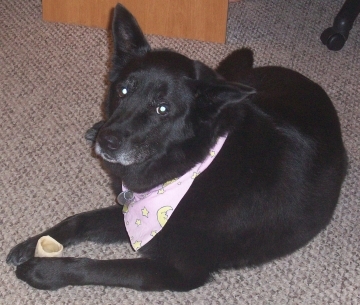 For more cute pet photos, check out our Wordless Wednesday blog hop at http://www.petautosafetyblog.com. As pet blogger and proud owner of a Labrador Retriever, I was given the opportunity to preview this e-book titled “Labrador Retrievers: How to Be Your Dog’s Best Friend“. Although I wasn’t able to see the images in my free preview version, I found the content quite comprehensive. If you are considering getting a Labrador Retriever, everything you want to know about them is this e-book and available on Amazon.com at a very low price. Chapter one on the history of Labradors is brief. Chapter 2 was about where to get a Labrador Retriever. It was my favorite chapter because the author, Lorie Huston DVM, cautions against buying one from a pet store and gives some great information on how to find a good dog breeder or rescue group. 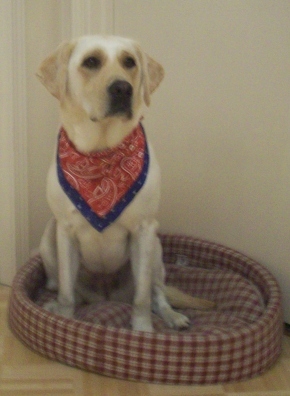 The next five chapters cover how to prepare your house for a Labrador, what to buy for him, basic training, socializing, care tips including some great feeding tips, and veterinary visits. One piece of advice which I found uncommon is that she recommends bringing your new dog home in a carrier or dog seat belt! Labradors can be a handful. Not only can a dog seat belt help keep your new pet safe, but it can also help keep them from being a distraction to the driver. In the chapter on basic training, Lorie Huston DVM not only covers the basics, but training on some behavior issues as well such as separation anxiety. In the chapter on training, she does not promote one training method over another but does stress against the use of dominance training techniques and even gives a very good explanation as to why. 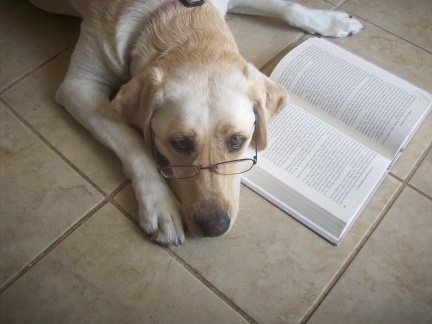 I really enjoyed the chapter on caring for a Labrador because it has great information on how to find the right food. It also has some good general proportion feeding tips since Labradors have a tendency to get overweight. 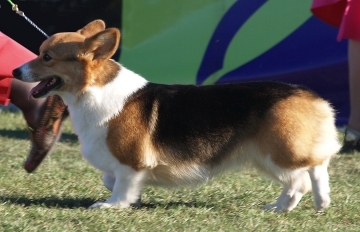 Other care tips include grooming, bathing, trimming nails, cleaning ears, brushing teeth, and what to look for in signs of illness or disease. Veterinary care tips include vaccinations, how to prevent pest problems (like fleas, ticks, and heartworms), the benefits of spaying/neutering, how to handle some pet emergencies, and so on. 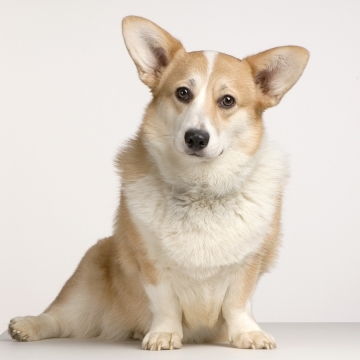 Since the author is a DVM, you know she has the expertise to share about dogs. 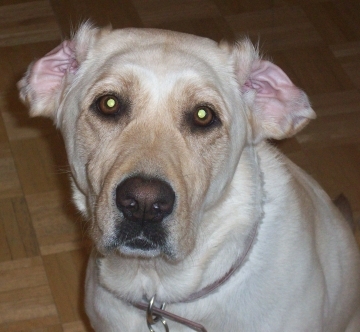 I myself have a Labrador, my girl Maya who was adopted, and can attest that the information in this e-book is very comprehensive and perfect for anyone wanting to get a Labrador. By the time I got to the 2nd page of the book, I read the following, “Puppies and adults both are happy dogs with constantly wagging tails and a fast tongue.” When I read this sentence, my confidence in the author’s knowledge was firmly established. It describes my Labrador to a T.
You can get “Labrador Retrievers: How to Be Your Dog’s Best Friend” as an e-book on Amazon for just $2.99. If you don’t have a Kindle, you can download the Kindle for PC on Amazon for free and read it on your computer. You can also enter a contest to win a free copy by visiting WOW! Women on Writing website – click HERE. Wordless Wednesday – Do I Have to Wear This? Do Your Dogs Wear Clothes? Sephi always wore a scarf but Maya and Pierson are not too fond of clothes. 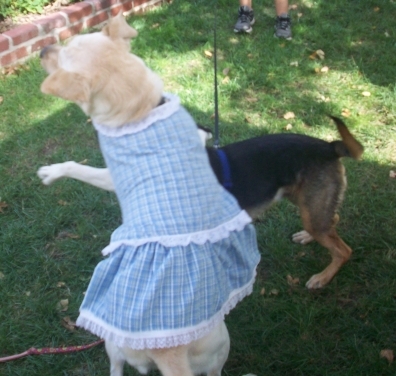 The clothes my dogs are wearing in these pictures were only put on long enough to take a photo (maybe a little bit longer for Maya in the dress but she was distracted with a playmate). Sephi loved wearing a scarf. Maya was having so much fun playing that she hardly noticed she was wearing a dress. 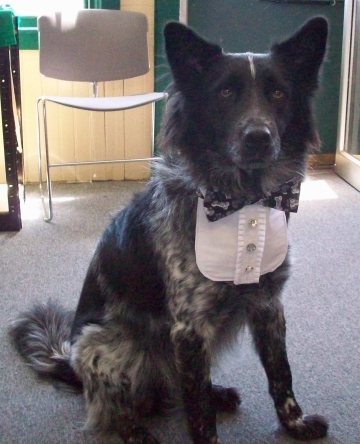 Pierson wearing an adorable tux made by Bow Wow Wow Gifts. 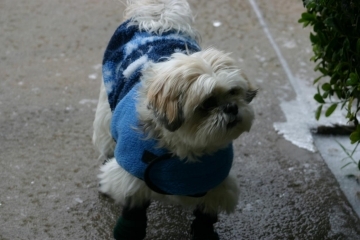 My parent’s dog Killer wearing a sweater and boots. 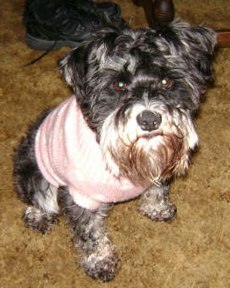 My aunt’s dog Madison wearing a cute pink sweater. 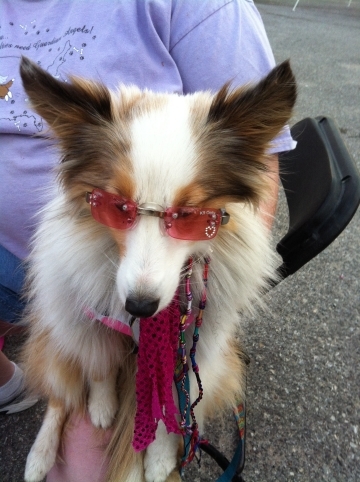 I saw this adorable Sheltie at the Mutt n Strutt 2012. 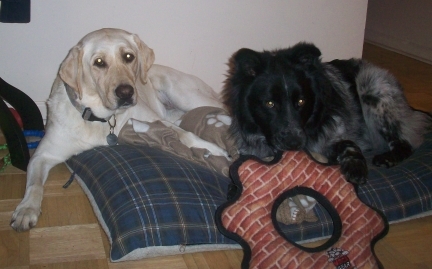 For other great Wordless Wednesday pet photos, visit the PetAutoSafetyBlog.com. 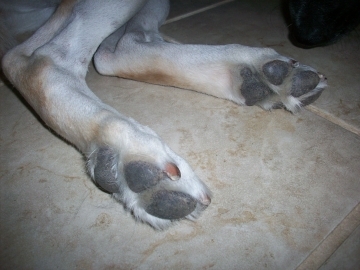 Nearly all Dog owners have to deal with fleas at some time or another. And the reality is that they can be a relatively expensive problem to deal with. We need to buy medications on a regular basis, and we need to normally apply them to our pets skin, which can be problematic. The great news is that there is now a fairly new product on the market that makes flea prevention and treatment about as simple as it could possibly be. Comfortis is becoming extrememly popular very quickly as it has a number of benefits over all other options we may have used in the past. This is a simple tablet that we give with food to our pets. We can either give it orally, or mixed in with food. The tasty beef flavor ensures they will devour it in seconds, and this certainly makes life a little bit easier. As we can see it is a very effective product. Comfortis for Dogs is the only orally ingested tablet that give protection against fleas for a whole month. All other options that protect for this long are applied externally to the skin. It allows owners to protect their pets without going through the trouble of applying chemicals to their Dogs. 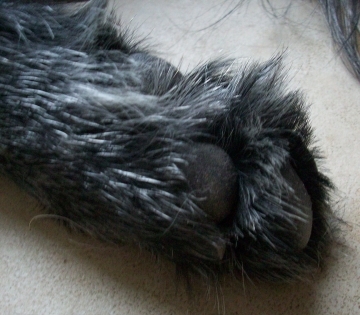 It also means that we no longer have to have that greasy patch on our pets coats where we apply the solutions. 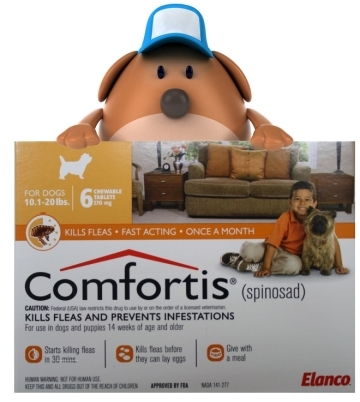 Comfortis for Dogs is actually a very competitive flea medication. The Comfortis price holds up well to all other brands and the fact is that it is actually a faster working treatment than the externally applied options. Buying for the best price is going to mean buying online, prices are much lower than at the vets. At Tato Chip we make it our aim to find the best suppliers so this is certainly a very good place to start. But always be sure to compare prices from suppliers that you have faith in, often you can find very good price by doing a little extra research. If you want a very fast acting flea treatment that prevents re-infestations for a whole month then we really do recommend Comfortis. It is cheap to buy, easy to administer, and a nice tasty treat for the Dogs too. 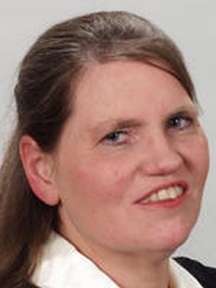 Guest blog from Karen at Tato Chip. 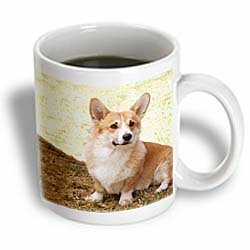 Karen writes about many different pet meds at the TatoChip site. She also gets plenty of help from her two companions, Tato the Cat and Chip the Dog. Last Saturday (July 7th) I had a fun Logic Problem Puzzle to solve. In the logic problem puzzle, 6 clues were given so that you could try to figure out which dog of which breed had which dog toy and where. Before reading this, you might want to check it out. 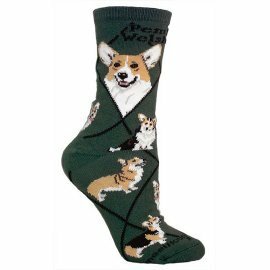 Below, you can also check out photos of my dogs with various dog toys. Daisy is the Staffordshire Terrier (clue 4). 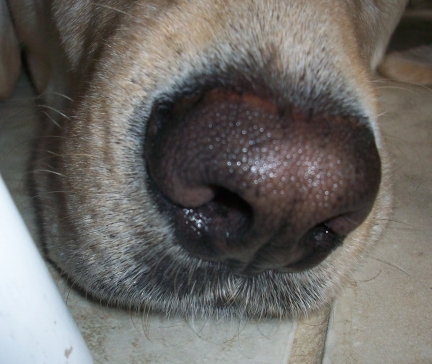 The Tuffy’s dog toy was brought by the Labrador (clue 2). Bandit had the puzzle toy (clue 5), so he isn’t the Labrador. Bandit wasn’t the Rottweiler or Chihuahua (clue 6) so he must be the Shepherd. Max isn’t the Labrador (clue 1), Staffordshire Terrier (because Daisy is), or Shepherd (because Max is). He went to the dog house (clue 1). He also wasn’t the Chihuahua (clue 1), so he must be the Rottweiler. By elimination, Lucky is the Chihuahua. Lucky didn’t have the Tuffy’s dog toy (clue 2), so Zoe, by elimination, must have it. The rope toy was neither Max’s (clue 1) nor Lucky’s (clue 2); it was Daisy’s. The dog with the Nylabone went to the dog bed (clue 3), so Lucky went there since the dog toy or place eliminates the others. By elimination, Max had the Kong dog toy. Bandit wasn’t found under the tree or indoors (clue 5); so he must have been playing in the pool. Daisy wasn’t found indoors (clue 4); Zoe was, and by elimination, Daisy was found under the tree. Pierson playing with a Tuffy’s. They still haven’t torn this dog toy up! 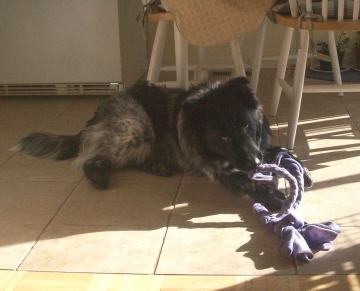 Pierson playing with a fleece rope toy. 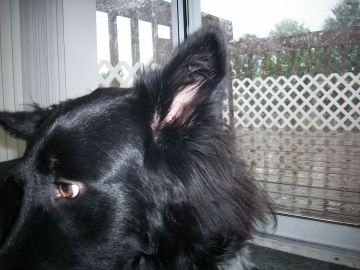 For more fun pet photos, check out the Wordless Wednesday blog hop on my other blog, http://www.petautosafetyblog.com. 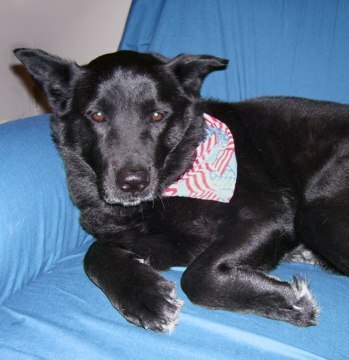 Today, the Pet Auto Safety blog doesn’t feature pet travel, it features photos of Shiera, a lost dog who reunited with her owner after being lost on the 4th of July. It has been a while since we’ve done a dog puzzle. I love logic problem puzzles so I thought it would be fun to make one. Make a grid which lists each of the five dogs, toys, breeds, and places (as indicated below). Then with the six clues given, use a process of elimination and other logical techniques to find the answers. 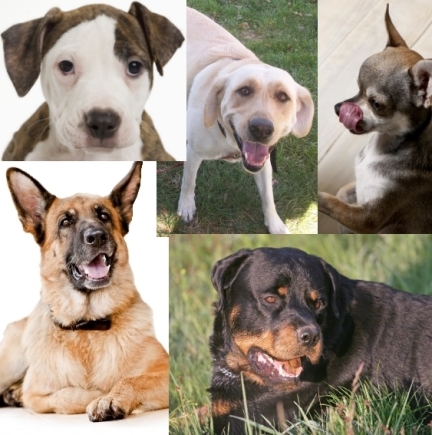 The first five dogs (Max, Bandit, Daisy, Lucky, and Zoe) to the Doggie Day Care were all dogs of a different breed (Labrador, Shepherd, Rottweiler, Chihuahua, and Staffordshire Terrier). Each brought their own dog toy (Tuffy’s, Kong, rope toy, Nylabone, and puzzle toy) and each went to a different part of the Doggie Day Care play area (one stayed in the dog house, one in the swimming pool, one under a tree, one in the dog bed, and one stayed indoors. Can you tell which dog was which breed had which toy and went where? 1. Max, who wasn’t the Labrador or the Chihuahua, went to the dog house with his toy, which wasn’t the rope toy. 2. Lucky didn’t have the rope toy and he wasn’t the Labrador with the Tuffy’s dog toy. 3. The dog with the Nylabone is the dog who spent time on the dog bed. 4. Daisy, who didn’t stay indoors, was the Staffordshire Terrier dog breed. 5. Bandit had the puzzle dog toy but he didn’t stay under the tree or go indoors. 6. Bandit was neither the Rottweiler nor the Chihuahua. 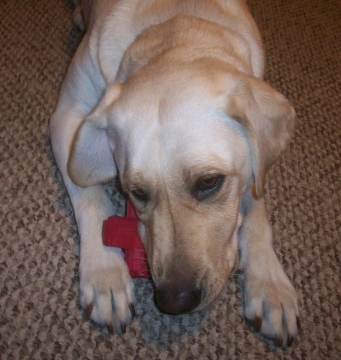 We will post the answers on Wordless Wednesday along with some photos of my dogs playing with certain dog toys. Wordless Wednesday – Happy 4th of July! 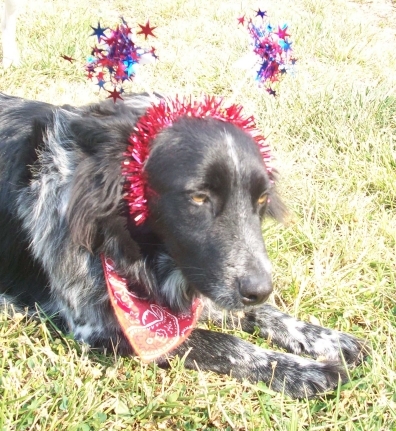 Check out y dogs Maya and Pierson in their 4th of July spirit! Here is one of Sephi too. She always wore an American flag-designed scarf in July. Remeber, enjoy the 4th with your dogs but don’t take them to watch the fireworks! For a couple other photos of Maya and Pierson, and to also check out other pet photos on the Wordless Wednesday blog hop, click HERE to visit our Pet Auto Safety Blog.